I’ll start this post with an apology. There will, in about eight months, be another Nielsen to terrorize the motorcycling world. I’m sorry. The other day my son Kelly informed me that I was going to be a Grandfather. This can’t be true I said to myself, I’m not that old!!?? A quick look in the mirror and guess what…I am that old. Damn. I started riding at the ripe old age of fourteen, I rode my fathers Honda CB160 right into the back of his ’66 Impala. Being the good dad, he first asked if I was OK, I said yeah…but as he was asking the question he was checking out the motorcycle. I don’t believe that he even heard my answer. That’s OK too. From that time on I loved motorcycles. It was my stepfather that truly injected the sickness to me. I can’t thank both of them enough. My son Kelly was about two years old when I first put him on a motorcycle. Trail riding in the Kennedy Meadows area of the southern Sierra’s. Outfitted him with helmet, goggles…(do you know how hard it is to find goggles, much less a helmet to fit a two year old??!! ), gloves and whatever I could find for protection. Here we are on my trusty Husqvarna 250 getting ready for a fun ride through the mountains. Over the years I would take Kelly to school on a motorcycle, go to the Speedway races in Costa Mesa on a bike, all over the place and all on a motorcycle. But for some reason the sickness never infected him. Where did I go wrong?? Fast forward a few years. Kelly graduates from high school and we send him off to Europe for three months or so. It’s amazing what you’ll do to get your kid out of the house! Downside…he came back. Upside…he came back and wanted to ride?! Cool. He had rented a small motorbike in Greece and got hooked. He told me that he never understood my obsession until then. We spent Christmas day riding around the hills of our town just having a blast. He on our little trusty CB350 and me on..I don’t remember. Put the boy in the local MSF course, got his license, made him spend six months riding the little 350 and then got him his own bike, a Honda Hawk GT. He still has it. 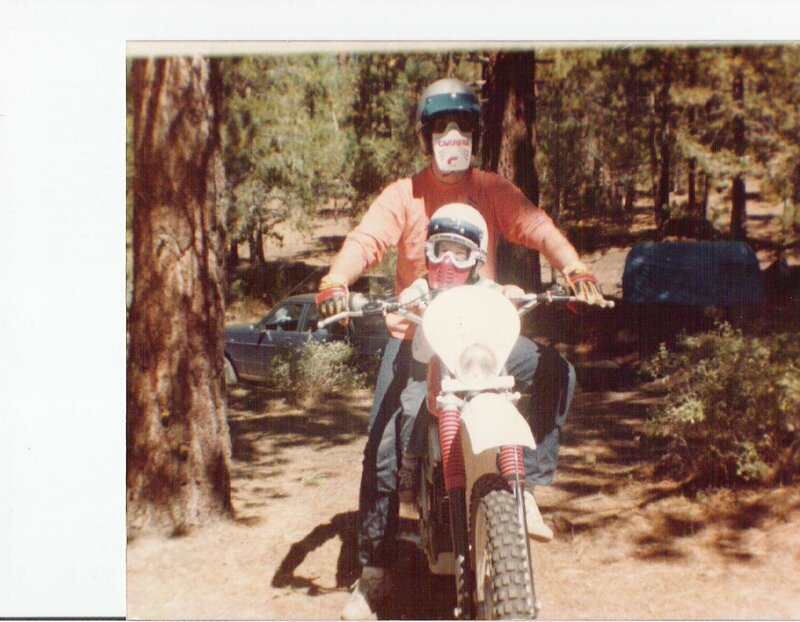 Another short ‘fast forward’ here, my father who got me started, wanted to ride again..great. But..he hadn’t ridden a motorcycle since the days of the Honda 160. Search the classifieds and back yards and found my dad a ’71 CB350, the perfect starter bike…it seems I have a thing for the Honda 350’s…it’s a weird sickness don’t ask, I don’t know why. Anyway, same thing for dad, MSF course and time on a little bike. Next up, a Honda GL500 Silver Wing..neat little bike and a good traveler. Dad and I ride the SCMA 3 Flags Classic, Mexico to Canada in 3 1/2 days, together a couple of times and some other good trips. Dad was in his 60’s at the time and just as enthused as a kid, it was great. At the same time as all this was going on, I was roadracing out at Willow Springs here in Southern California, AFM in Northern California and doing the western AHRMA races. My dad became the crew chief of our team and was having the time of his life. But…something was missing, Kelly. For some reason racing didn’t appeal to him..wuss. I don’t know what happened but one day my son decided that racing might be fun…duh… So we bought another Honda Ascot to go singles racing and get him started. After a few races on that evil thing (“that bike is trying to kill me”) we actually got a proper race bike, a Yamaha YZF600. Set it up and off he went. The highlight of this time was the WERA 24Hour Endurance race at Willow Springs. The whole family, my daughter as a scorer, my son and myself as racers and of course my dad as crew chief. So, like I have said before, when the family rides together, there is no generation gap. This entry was posted in Helmet Time and tagged endurance racing, honda, honda 350, honda gold wing, honda silver wing, motorcycle racing, wera, willow springs, yamaha on January 14, 2009 by themotoworld. Right now, if you are lucky enough to have a TV service that brings you the Dakar Rally, I envy you. I have been hooked on the Dakar for years. I would read about in the magazines, follow it on the internet and when Speed TV broadcasted it, I was glued to the TV. There is no greater test of man and machine than the Dakar. Two weeks, thousands of miles, the most extreme conditions imaginable; all on your motorbike. No fancy motorhomes, no elaborate catering, teams service the bike during the night, if you are a privateer with no team, you service the bike yourself and try to get enough sleep to start again the next morning. And, this is if nothing goes wrong. It originally was the Paris-Dakar Rally. Paris France to Dakar Senegal Africa. Starting under the Champs Elysee in Paris, a short ‘Special’. Across the French countryside to the Mediterranean. An overnight ferry ride and you’re in Africa, now the Dakar really starts. The rally features cars, motorbikes and trucks. Cars that many of us here in the USA never see, motorbikes specially built and trucks…BIG trucks. The trucks are the wild part of the race I think. In years past it was the support trucks that had their own race, now they have their own class and it is amazing to watch. Next to the motorbikes it is my favorite race to watch. Things changed this year however, the rally has moved to South America. Two years ago a section of the rally in Africa was cancelled due to terrorist threats. The entire event had to be airlifted half way across the continent. Hundreds of cars,trucks,motorbikes and support teams. What a monumental effort. Last year, 2008, the rally was all set to go, everybody was there. Riders, drivers, mechanics and staff. At the last minute, literally the last minute, the race was called off again due to terrorist threats. All that time, effort and money wasted because of a few dangerous nutballs. I have friend who was part of a team, they spent a year building and testing their bike. They were there in the bivouc excited as hell to be there and then to have it all tossed away. Heartbreaking to say the least. At the US MotoGP round at Laguna Seca last summer, I had a chance to talk with Toby Moody about the threats. Toby was the announcer for the English speaking television broadcasts. He said it was very real and everybody felt very unsafe. The end of the Dakar? No way. The organizers basically told Africa, you don’t want us…OK, we’ll go somewhere else. South America was more than happy to have the rally. Over three months time a route was planned, Argentina to Chile and back to Argentina. Fourteen days…the Andes, the Patagonia, the Atacama Desert…from below freezing to 100*. This will be the the rally of rallyes. It is the mother of all motor racing, a true spectacle. Take a look at it and you’ll be hooked too. Now, if only my TV service provided coverage…sigh. I guess I’ll wait for the video. This entry was posted in Helmet Time and tagged dakar rally, motorcycle racing, offroad racing on January 6, 2009 by themotoworld.